Master this tool and technique, and you can rest assured that whatever you wall-mount—mirror, television, or shelves—won't be going anywhere. When hanging heavy mirrors, bracing large furniture, wall-mounting a new television, or erecting shelving, you need to start with the sturdy support of a 2×4 wall stud. Sure, nailing into drywall alone may be sufficient for hanging light wall art, but these fasteners can cause the wall to crumble if weighed down too much—not like the wood studs that exist to hold up drywall. There’s too much at stake to be less than 100 percent certain of the location of the stud’s center. Why risk a kitchen shelf loaded with dishes or baking supplies crashing down at any moment because you miscalculated where to place the fasteners? Fortunately, stud finders are practically foolproof and even easier to use than the old-school stud-finding methods,which can come in handy in minor situations. 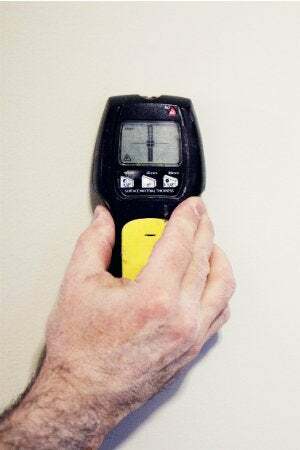 Read on for how to use a stud finder for a worry-free wall-hanging project. Get to know the kind of stud finder you picked up. Is it a magnetic stud finder or does it read the density of the wall? A magnetic stud finder will read screws and nails behind the wall, but whether or not these are dead-center still requires some guesswork. If your project is valuable or heavy, it’s best to use a center-finding density-reading stud finder that will show the edges of your studs. No matter which type you pick up at the home improvement store, how to use a stud finder doesn’t change—only the information is displayed differently. Decide where you roughly want to hang your item. Know where the top should be and how far down it requires mounting. This is the height at which you want to search the wall for studs. Remove any nearby wall-mounted photos or other partly-metal objects that could interfere with readings on a magnetic stud finder and set them aside for now. 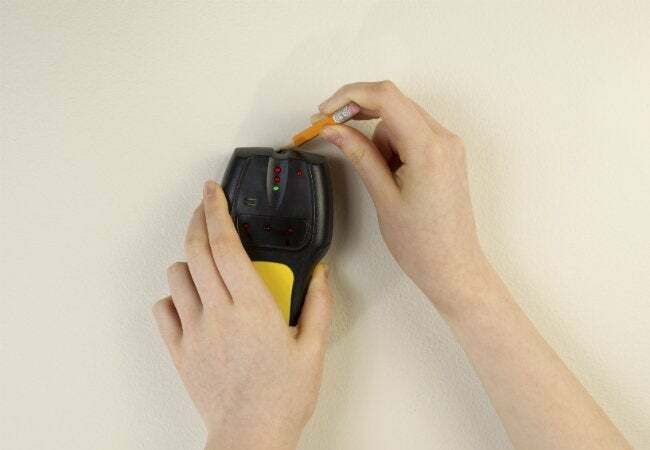 Ensure your stud finder batteries are fresh and functioning, as weak batteries can greatly distort readings. Also check to make sure the flat side of the stud finder (where you’ll see the contacts and usually some felt to protect the wall from scratches) is clean of debris and dust. Studs are typically either 16 or 24 inches apart, so you’ll be looking for a stud somewhere within a two-foot span. Hold your stud finder flat against the wall, about 1 foot left of where you ideally want to drill. Slowly slide the stud finder to the right, horizontally, while keeping the unit flat on the wall. When the stud finder alerts you to a stud—via a beep or flashing light, depending on the finder in question—retrace the last few inches with the unit, to double-check where the alert is occurring. Mark the correct spot with your pencil. If you’re using a center-finding stud finder, you’ll be shown where the edges of the studs are. Mark each edge so that, when you go to drill or hammer into the stud, you’ll know where dead center is. Don’t accept this alert as the end of your journey; instead, continue searching for the flanking studs 16 to 24 inches away from the initial mark following steps 3 through 6. Even though your tool indicated that it located a stud right where you need it, a stud finder can signal false positives when there is metal piping or flashing or brackets within the wall. Make sure your alert wasn’t a false positive by also locating the studs on either side of the one on which you plan to mount your mirror, television, shelf bracket, or other heavy item. Mark their locations upon finding them, and then measure. If, in fact, they are 16 or 24 inches apart, then you’ve found your center stud. Now you’re ready to hammer or drill as needed. Proceed carefully and precisely, and you’ll have no regrets. Of course, if you prefer the DIY route, you can find wall studs without dedicated equipment. While not fail-proof, these three methods will come in handy if you choose to forgo using a stud finder.